Find your baby name here based on Indian Astrology. Moonastro has largest collection of name database having 60,000+ baby names which can be searched on your baby's Birth day. Here we do suggest a baby name for your baby boy or girl based on your origin. We will calculate baby's moon sign (Rashi), birth star (Nakshtra), position of Jupitor and the lucky Life number. We will then filter our database based on baby's gender, number, origin, rashi, Nakshtra and position of Jupiter (Guru) on birth chart. 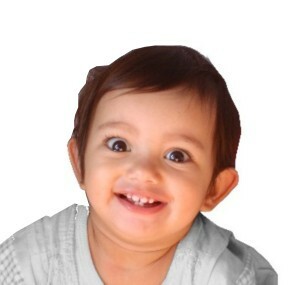 This is first time ever on internet where you get customized baby name suggestion for Free. Numerology is used here is followed from famous numerologist ever, Cheiro which is the most effective Name numerology system ever invented. Cheiro numerology defines number from 1 to 100 for each name (instead of 1-9 in other systems) and calculated based on all different combinations from 1 to 100. In Indian numerology there are three ways a name is identified. First way is to decide on the first letter of the name. First letter is indeed a very important matter. For example, Indian astrologers suggests persons with art background like film personals, singers, etc to have the name start with letter “K”. This method was successfully applied to many Stars so far and they became Star after the name was changed. Second formula applied is the use of name expression number. Expression number is the number calculated from the first name only and calculated to number 1-9. Expression number must match with the date of birth of the native. Every date of birth can result various numbers and expression number is one of the output from it. It also defines certain characteristics of the person, like if a person has expression number 9 then he or she must be very realistic and likes to be in stable position. Person is predictable and does not like much change. At the same time, they are ruler and can be a successful warrior or soldier. Third logic applied is to find the name number which is calculated from Name and Surname of baby boys and baby girls. Add the numbers from Name and Surname which may add up from 2 to 100. Every number has got a meaning and that should satisfy the goal of the person. For example, if a person wants to be a successful politician, then the right name would take him to success, but at the same time he may not gain peace in family life or may be not good for mother’s health. There are 12 different aspects or direction in which every name will work and the person choosing the name should decide which part of the life should get prioritize by the name. According to his priority he or she should select the name. Finally all the above three logic are combined and as per the personal goal of the native and then from the list of name one suitable name can be chosen. Or may be with the name that is not in the list can apply the above three logics to determine whether the name is perfectly chosen or not.